Missed out on applying or being shortlisted this year? Entries for 2019 are now open! You have until 17 May 2019 to apply. Two of our categories have different entry forms - to apply for the Young Energy Professional of the Year Award click here, and to apply for the Energy Champion award click here. 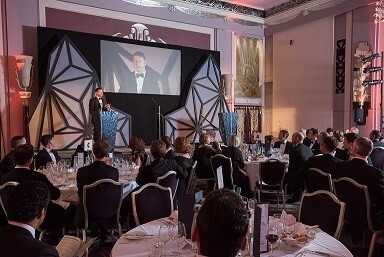 The awards ceremony will take place on 7 November at the Sheraton Grand, Park Lane, London. Tickets are now on sale for £160 + VAT. This early-bird rate ends on 16 September, book before then to take advantage of the lower rate! The EI Awards have been running for 20 years, designed to celebrate and showcase the vast accomplishments in the energy sector, an industry vital to society. Winning an EI Award provides a prime opportunity to have your achievements officially recognised by a senior panel of energy experts and the wider industry. The winners will be revealed at the EI Awards gala dinner and ceremony, which will take place on 7 November at the Sheraton Grand, Park Lane, London. The awards ceremony is the perfect opportunity to entertain your most important clients and make new industry connections, in an exciting evening of celebration, entertainment, and fine-dining. This award is aimed at both energy companies that have instigated projects for the benefit of communities amongst which they work and communities undertaking their own initiatives, to tackle energy issues or draw help and advice from energy companies. Successful projects will be able to prove a unique and unprecedented energy-related benefit for a community. The project or initiative should be of a ground-breaking nature and go above and beyond a standard CSR activity. You must be able to validate the success of your project with proven results. Entrants should provide evidence of how their work and achievements meet as many of these criteria as possible. Effective energy management is crucial to ensure the efficient use of energy in a domestic, commercial or industrial setting, and investments in energy management produces a wide range of benefits, including reducing your organisation’s costs and cutting greenhouse gas emissions, in addition to improving energy security. This award recognises individuals or organisations that have effectively deployed practices to improve their energy efficiency performance through the design and implementation of materials, systems, software and supply chains; and / or which have been able to reduce their carbon emissions and energy waste. Entries from commercial organisations are welcome, in addition to local authority, healthcare and housing trust’s entries. You must be able to validate the success of your project with proven results. It is increasingly important for the energy industry to reduce its impact on the environment and give back to the planet. For this award the judges are looking for schemes and projects that enhance the environment or offset carbon emissions. Entrants should demonstrate a responsible and ethical commitment to managing the risks of energy to the environment and reducing the carbon footprint of the industry. The energy industry could not operate without proper regard to health and safety and standards for safe practice are robust and subject to continuous review and refinement. For this award the judges are looking for projects which have demonstrated best practice in safety as well as in areas such as occupational health, mental health, performance, productivity, hygiene and resilience through change. We are looking to acknowledge teams, individuals and projects that take a unique approach to health and safety and demonstrate the potential to have an impact on the industry's overall health and safety record. Technology in all its forms is an exciting area of the energy industry, a frontier where new and better solutions are constantly being devised. This award will recognise the year’s best new innovative technological development or implementation of an existing technology with the power to become a gamechanger/disrupter in the industry. Effective public engagement is very often the key determinant of the success or failure of any initiative. This award will recognise the year’s best group or individual contribution to raising public awareness across the energy industry, covering internal and external communications with such stakeholders as customers, regulators, employees, shareholders etc. The award recognises innovative campaigning techniques in the form of social media, reports, journalism, digital campaigns etc., that have contributed to improved understanding and knowledge of industry-wide energy issues. The EI's Young Professionals Network is delighted to welcome entries for the sixth EI Young Energy Professional of the Year award. Young professionals are the next generation of energy leaders and we want to celebrate your contribution to the industry and reward your innovation, drive to deliver and passion of the younger generation of energy talent. Applications from those with less than five years in the industry are welcome. "What is the single biggest challenge facing the energy industry in the next 20 years?" The judging panel will be looking for you to demonstrate your views and feelings about an industry issue, including how you would like to see them addressed and how your future work might contribute towards finding a solution for this challenge. Please provide a written endorsement of up to 200 words from your employer, client or supervisor. This should include their signature and contact details for verification purposes. Entries for the EI Awards are peer-reviewed by an independent panel of respected industry experts. Steve, an engineer, has worked in the world of energy for over 30 years and has held a number of executive and high level management roles in major international engineering companies. Most recently, Steve led the commercial activities of GE Power in Europe, supplying power plants and transmission systems, and was previously the UK Country President for the Alstom Group supplying projects and equipment for electricity generation, transmission and distribution, and rail transportation. Angela Terry is an Environmental scientist with over 20 years' experience in developing renewable energy projects including wind farms, solar and hydro schemes. She is a pioneer of community renewables in the UK, raising over £15 million for community-owned, clean energy projects including the first wind farm in the SE of England Westmill. Dr Joanne Wade is a sustainable energy expert with 30 years’ experience in energy efficiency and community energy. She is the Chief Executive of the Association for the Conservation of Energy (ACE), a Trustee of the Energy Institute (EI), and Chair of the EI’s Energy Advisory Panel. Her work is currently focused on buildings energy efficiency policy and practice. James Brittain is an energy, sustainability and behaviour change specialist with over 20 years’ experience of delivering energy savings and performance improvements for many organisations. He understands that biggest savings often come about through combining technical and people solutions across both operational and development teams. Ashley is a chemical engineer by training, and worked in process plant design and operations for ICI and INEOS for 18 years. He is currently Principal Inspector of Process Engineering for the UK offshore oil and gas sector, within the Health & Safety Executive. A key focus of his role is ensuring that operators have effective systems in place to prevent major losses of hydrocarbon containment, such as occurred at Piper Alpha. He is a Fellow of the Institution of Chemical Engineers, and a registered Professional Process Safety Engineer. John Moylan led the BBC’s coverage of energy, reporting for national TV & Radio News Bulletins from nuclear power plants, wind farms, fracking sites and from offshore in the North Sea and the Gulf of Mexico. As the BBC’s Industry & Employment Correspondent, he also covered major stories including the steel industry crisis, the VW diesel scandal, industrial relations and the gig economy. John’s 20 year BBC career spanned “Tomorrow’s World”, the dot com boom, the financial crisis and a spell in Brussels as Europe Business Reporter covering the EU institutions and WTO trade talks. John is now a director with the strategy and reputation consultancy Stonehaven. Cheryl’s specialities include transitioning to a smart, sustainable energy system; energy strategy, social enterprise, business development, business planning, sustainable energy policy, advocacy, spatial planning, government liaison, change management, team management & building. Cheryl chairs the Entrepreneurial Women in Renewable Energy network, established by Regen to support the renewable energy sector to harness talent from across the sector. For 20 years the EI Awards celebrated the most outstanding people, products and initiatives from across the global energy sector. The awards attract entries from businesses which make the industry safer, cleaner and more sustainable, and which champion new initiatives in energy to make a real difference to society. The EI Awards is recognised as the energy industry’s most important competition. Showcasing the most ground-breaking work in the energy sector. It provides a platform for the industry to celebrate those businesses and individuals who innovate, communicate and drive up the standards of professionalism within the sector. Aligning your company and brand with this prestigious competition will allow you to share your core values with the industry and to gain recognition for your excellence and leadership. For more information please contact sponsorship@energyinst.org. What do our sponsors say? The EI is delighted to invite you to become a valued sponsor of the 2018 EI Awards. The winners of the 2017 EI Awards competition were announced on 9 November at the Sheraton Grand Park Lane Hotel in London in front of an audience of hundreds of industry leaders. The celebrations, which included a formal dinner in recognition of all of those shortlisted, were hosted by former England Rugby star and A Question of Sport team captain, Matt Dawson MBE.